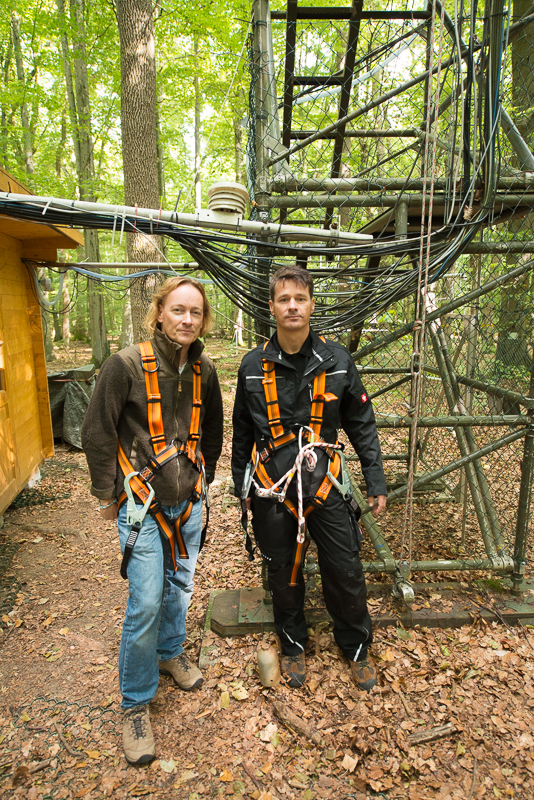 At the end of August 2018 a consortium was initiated by Dr. C. Thiel (DLR) to start a flight campaign within the Hainich national parc area in Thuringia (DLR Jena: Dr. C. Thiel, FSU Jena: Dr. S. Hese, University Göttingen (LS für Bioklimatologie, Prof. Dr. A. Knohl / Dipl.-Ing F. Tiedemann), national parc Hainich: Manfred Grossmann & Andreas Henkel). 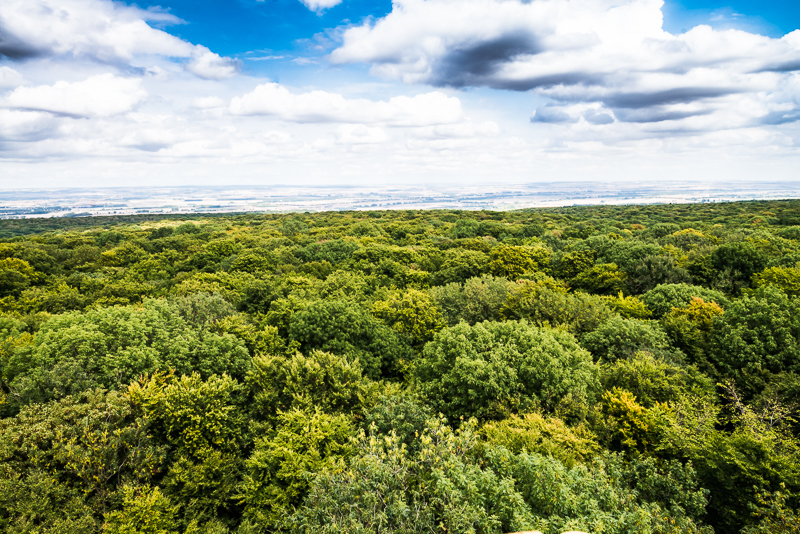 The region is famous for its natural growing and undisturbed old deciduous forest. Various research groups are working here. 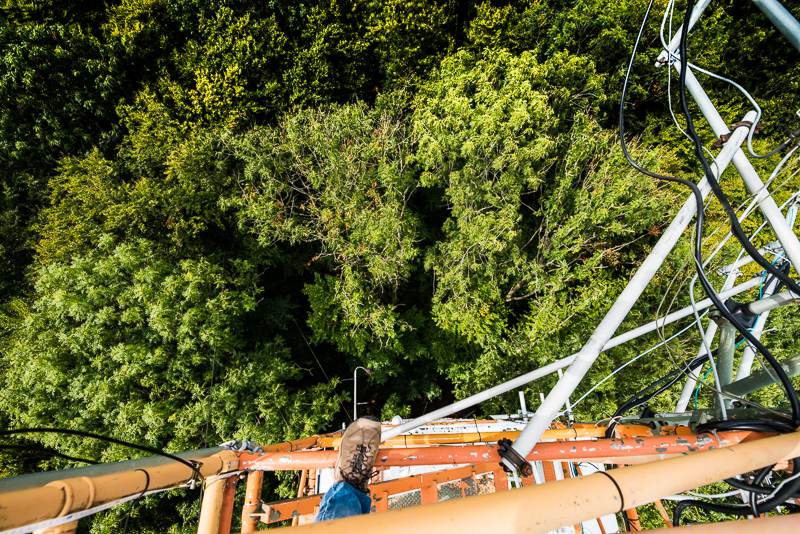 In the central part of the national parc a 40m flux tower owned/maintained by University Göttingen is installed to measure gases, precipitation and other parameters. This platform is also nicely usable as a starting point for copter based mapping of the crown surface. The flight was authorized by the Hainich parc administration and documented also by MDR (though the video seems to be offline already as of 19.9.2018). 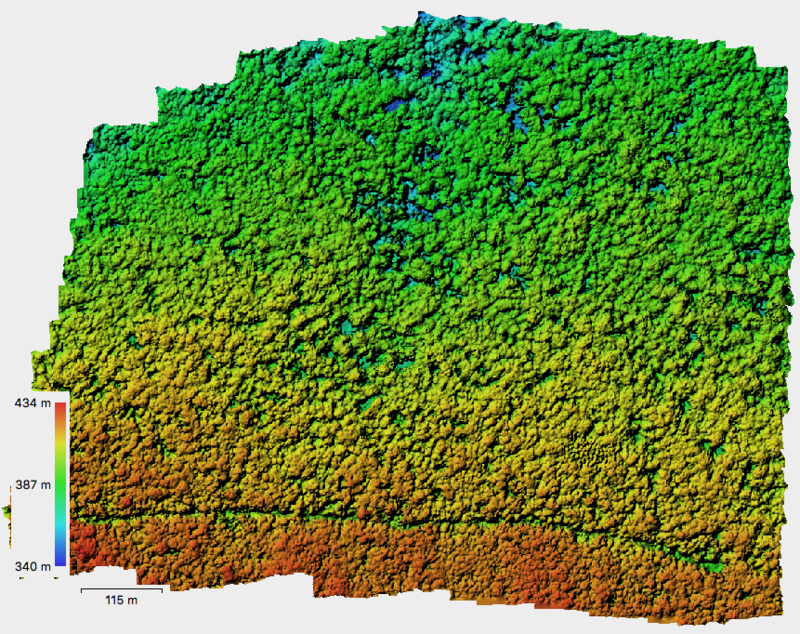 The overall goal of the copter flight campaign was multi folded: mapping of the full crown surface with as much details as possible, tree crown species classification and crown structure differentiation, individual tree crown mapping and stand density approximation with various linked possible analysis scenarios (LAI / biomass / stem volume mapping). 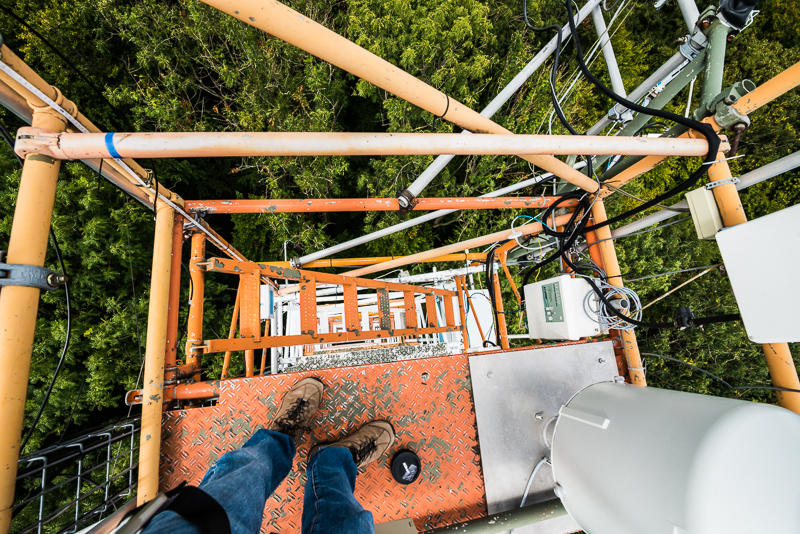 Since within stand DGPS point measurements are difficult to do and sometimes inaccurate – the overall spatial geo-referencing accuracy of this mapping campaign will also be investigated. 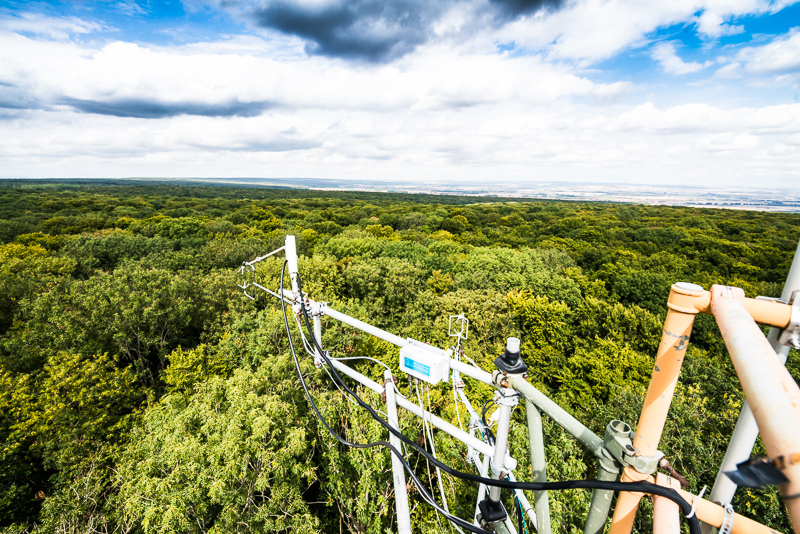 Fig.1: Hainich deciduous forest canopy cover shot as panorama from the flux tower – 270 degree panorama. Approximately 100 ha were mapped with the Phantom 4 Pro with two different DJI Ground Station Pro flight plans in 100m altitude with a 75/75 overlap using two different battery sets. This generated 650 Nadir RGB images. Processing the files was done 1. in Adobe Lightroom (defringing / microcontrast) and 2. in Agisoft Photoscan. The point cloud processing was done on a full speced-out MacBook Pro 2017 with an eGPU Nividia GTX1080TI in an external Stonex eGPU Breakaway Box 650. Meshing and texturing was done on a GTX1080TI & GTX980 setup in a 124GB RAM PC configuration. DGPS reference point selection (4 points measured by DLR/FSU) and integration took place in Agisoft. MDR reported in a 5 minute take in September 2018 (right now: offline). Fig. 2: Subset of the ortho image mosaic that was created from the 650 x 20Megapixel files. Fig. 3: Digital Surface Model (not ground height normalized) of the full data mosaic. Fig. 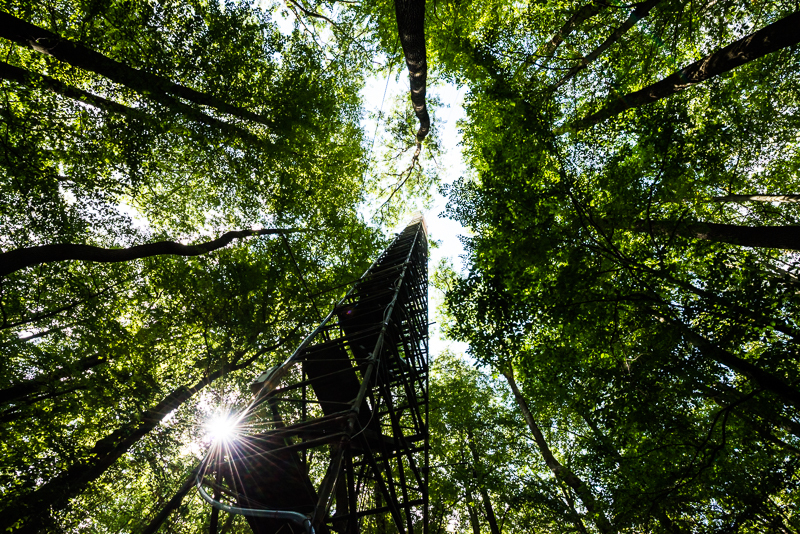 4: Flux tower – view from ground level up into the sky and forest. Fig. 5: Climbing equipment advised but the tower is a pretty robust construction – we had no problems climbing up and operating the copter from up there. Fig. 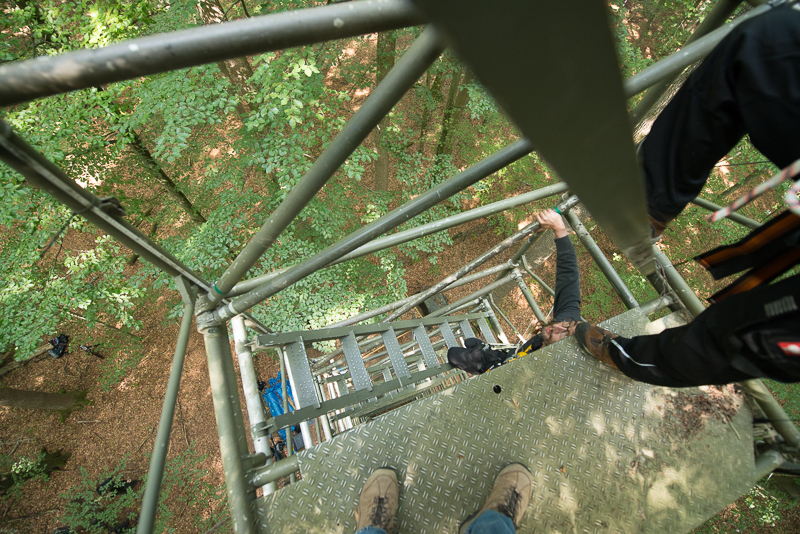 6: Various pictures from the overall view from above (it is stunning) and climbing the tower. This is the perfect starting point for copter based flight campaigns.